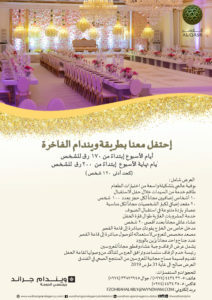 Celebrate your dream wedding or special event at the Al Qasr Balloom in Wyndham Grand Regency Hotel Doha! 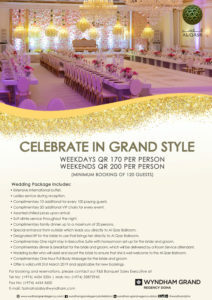 Rates start at QR 170 per person for weekdays and QR 200 per person for weekends with minimum guaranteed of 120 guests. Promotion is valid until 31st of March 2019.